One of the key pieces in the Nelson and Norfolk exhibition is the magnificent painting commissioned by the then Corporation of Norwich in 1801. The painting hung in St Andrew’s Hall for many years as depicted in the painting by James Sillett, which has been transformed through conservation for this show. More recently it hung in the next door Blackfriars Hall, high above the panelling that houses many smaller civic portraits. Just accessing the painting to undertake basic assessments required a tower scaffold. The framed portrait is over three and a half meters tall and could be expected to be very heavy. The canvas appeared to be in good condition having been treated in the 1980’s. The frame, although structurally sound, needed areas of decoration to be secured, and fully cleaned. A plan was developed to remove the portrait, separating the canvas from the frame, for specialist conservators to treat, before reuniting them for the exhibition at the Castle. It was suspected that the painting was moved internally from St Andrew’s to Blackfriars before the alterations that added a bar and access ramps between the two. This meant that it could not go out via the large doors of St Andrew’s Hall, and would have to go via a side door in Blackfriars. Measurements taken whilst up the scaffolding, and at an angle through the arched door were very tight, and the team remained nervous to the end, whether it would fit through! 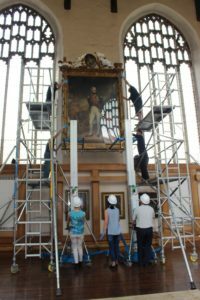 Many other logistical headaches and plan amendments later, a team of NMS technicians, conservators, and contractors found themselves removing this massive painting on the hottest day of the year. 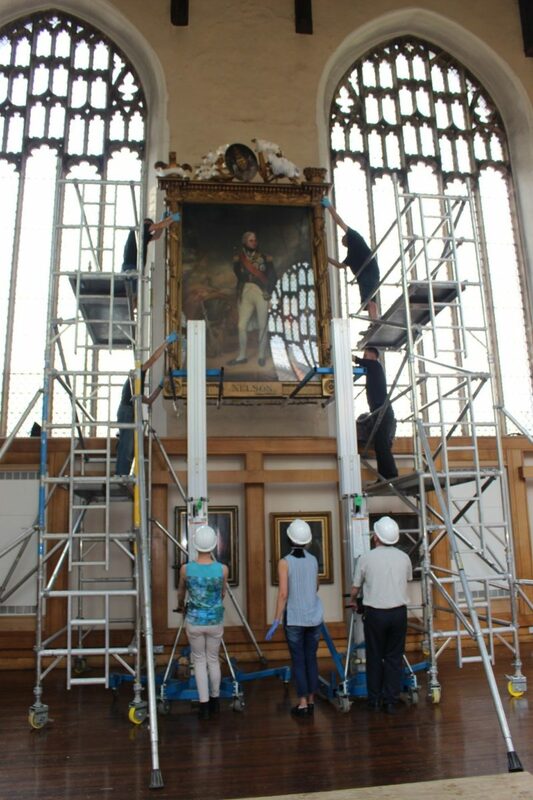 The portrait being lowered from the wall. The canopy of the frame was packed and secured ahead of the move, and was then separated for transportation. Once at ground level it was clear that it was more fragile than had been anticipated, so further packing was undertaken by conservators to ensure it could travel safely. The canopy being removed from the frame. 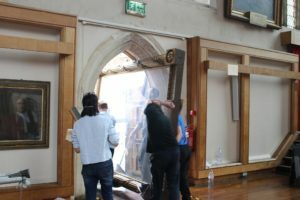 Once the canvas was removed from the frame, conservators and technicians were able, for the first time, to assess the inside of the frame and determine what would be required to glaze and refit the painting safely for the next couple of hundred years. The next nerve racking bit, was to remove the frame from the building. What were we worried about? There is plenty of room! The frame was packed in the courtyard for transport to the conservation studio. This painting is well known and popular, and people have travelled great distances to see it in the past. However there are numerous letters on file showing how many were disappointed at not being able to see it clearly due to the height at which it was hung, the perspex glazing, and the reflections from the large windows. Now, this exhibition, not only provides unprecedented access whilst at the Castle Museum, but by enabling the glazing to be upgraded, will also provide greatly improved viewing once the painting returns to St Andrew’s Hall.